If you’re one of the many who’ve wished for softer, more defined, or simply better skin but were at a loss as to how to achieve this goal, then Advanced Dermatology Care has good news for you! We offer state-of-the-art medical and cosmetic dermatology services to address a number of skin conditions. We offer these revolutionary services to our clients based on their unique skin conditions and, after consultation with your primary care doctor and Dr. Gremillion, we’ll construct a personalized skin care treatment plan to address your condition and get you on the road to the skin you’ve always wanted. While most of our clients come to us seeking cosmetic dermatology services, we have a number of patients who choose Advanced Dermatology Care to treat their skin condition, or utilize our medical dermatology services as part of their larger skin care regimen. Much like discussing your skin treatment options with your doctor when seeking cosmetic dermatology services, it is extremely important to speak with your physician or specialist before beginning a medical skin care treatment service with Advanced Dermatology Care. Whichever you choose, Advanced Dermatology Care is proud to offer these services to our clients after a private consultation and discussing your path towards better skin. Curious about how we help you achieve the skin you’ve always wanted? Keep reading to learn more. Laser hair removal is one of Advanced Dermatology Care’s most popular services, and understandably so. Many of us have area of our bodies where we’d prefer hair not grow, or at least not grow with such frequency or volume. With our laser hair removal services that feature the Lumenis Lightsheer Duet, you can rest assured that we can help you achieve a smoother, more supple skin. The Lightsheer works by offering lower fluence, making each hair removal treatment session more comfortable and faster. Moreover, it affords patients less downtime in between sessions. Just make sure not to hop in the tanning bed or spend lots of time in direct sunlight for two weeks following your session. It may sound like a name from a science fiction movie, but the Sciton Laser is one of the most sought after tools here at Advanced Dermatology Care. This seemingly magical laser works by gently removing damaged areas of the skin and improving skin’s overall vitality. The Sciton Laser can penetrate at levels appropriate for each patient, meaning that, if your skin condition calls for deeper laser penetration, the laser can be adjusted to meet your needs. Or, perhaps you’re only needing a more surface level treatment — no problems! 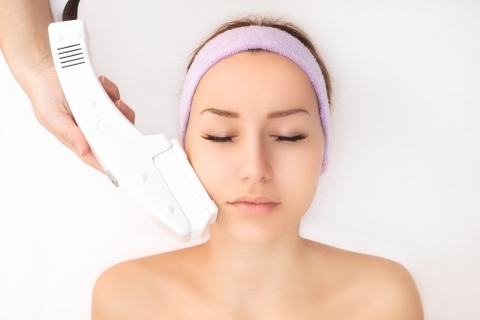 The Sciton Laser will work just fine for you and your skin condition. Many of us feel we could use a little shaping up. If you fall into this group, then Advanced Dermatology Care’s body contouring could be of great benefit to you. Featuring Ultrashape Power, this revolutionary body contouring service uses ultrasound technology to target stubborn body fat by painlessly destroying fat cells without harming or compromising the surrounding skin, blood vessels, or nerves. This forces the fact cells to rupture, releasing triglycerides which then pass naturally from the body. For most patients, three skin treatments spaced two weeks apart is the standard treatment and time procedure. Many of us bear the marks of a traumatic experience, surgery, or accident. These blemishes may manifest themselves in the form or scars or distressed skin. For others, wrinkles have become a problemed feature on their bodies. Whichever condition you’re looking to remedy, Advanced Dermatology Care’s wrinkle and scar treatment could work for you. Our Sublative scar and wrinkle treatment works its magic by utilizing fractionated bi-polar radio frequency to remedy stubborn wrinkles, skin discoloration, and acne scars. You may feel a slight prickly sensation once the energy from the machine enters your body, but this is a painless procedure that has been proven to work wonders on many different skin types. In just three or so treatments spaced four to six weeks apart, you can expect to experience noticeably softer and more defined skin. More formally known as photodynamic therapy, PDT is a skin treatment that is performed for the treatment of actinic keratosis. Performed in our office, this procedure addresses the sun-damaged areas of our skin. These damaged areas, known as actinic keratosis, have been shown to have a 10 percent chance of developing into skin cancer in two years’ time. This painless and straightforward procedure involves a chemical being applied to the damaged area and incubated. After, the skin is exposed to a blue light that activates the chemical to get to work on destroying sun-damaged skin cells. We each have our own reasons for seeking cosmetic or medical dermatology services. Each treatment is designed to address and ultimately improve your unique condition without causing further, other damage to the skin. By utilizing cutting-edge equipment and practices, Advanced Dermatology Care is afforded the opportunity to better serve our Monroe neighbors. We see a number of skin conditions that could benefit from our medical and cosmetic dermatology services, and we’d love to help you treat yours. If you or any of your friends and loved ones suffer from skin conditions, please don’t hesitate to contact Advanced Dermatology Care today to schedule your consultation and appointment.